Welcome to our review of the quietest portable air conditioners for 2019. We’ve all had those nightmarish experiences with air conditioners that are unbearably noisy. To stop you getting stuck with a dud, we’ve researched and reviewed the quietest portable air conditioners on the market. These air conditioners come in all different shapes, sizes, and power capacities. To keep things simple, we’ve narrowed our recommendations to three most common power ranges: 10,000, 12,000 and 14,000 BTU’s. Don’t know what a BTU is? Or how many you need? No problem. We’ve got a quick explanation at the bottom of our post – in the buyer’s guide. Not everyone wants to read detailed reviews – so here’s our top overall picks. Our top choice, overall, is the DeLonghi 12,000 BTU Portable AC. The dedicated ‘whisper quiet’ mode really helps to keep the noise down once your space is cool. With high-quality reliable parts and a meaty 12,000 BTU, it can really hold its own in the midst of a hot summer spell. Without having the price tag of a more powerful machine. Looking for an AC that won’t break the bank? Check out the Black & Decker 10,000 BTU Portable AC. The small size and quiet operation is perfect for bedrooms. It’s got a lower capacity, but it still does a great job for its size. With solid build quality and a ‘sleep mode’ to operate quietly at night, it’s a great purchase if you value getting the most out of your money (and a good sleep!). Functionality – Does it have multiple fan speeds / cooling modes? Ease of Use – Is it easy to use; how intuitive are the controls? Build Quality / Reliability – If it’s going to hold up over the years? Size / Looks – Is it excessively large; will it be an eyesore to have in the room? Value for Money – We agree that quality is worth paying for, but does the price reflect the value? Energy Efficiency Ratio – A cheaper upfront cost doesn’t mean much if it’s an electricity sink! 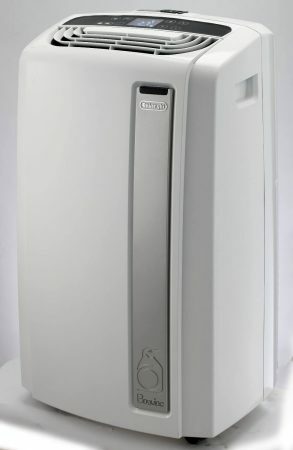 You're looking at the pioneer of 'Whisper Cool' AC technology. 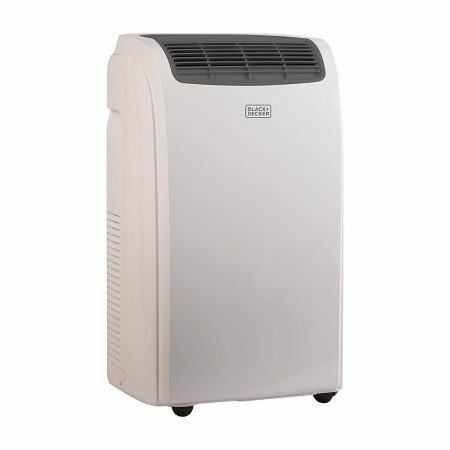 The DeLonghi AN120EW is our top recommendation for a well-made and quiet portable air conditioner. Just for this model, DeLonghi developed what they call ‘Whisper Cool’ technology – finding an optimal balance between cooling power and quietness. While this mode definitely makes a difference, a good tip is to give it some time fully cool down your space, before activating the quiet mode. This can be effortless easier if you can plan ahead using the timer function. As well as the quiet operation function, the DeLonghi also receives top marks for quality. The controls are very intuitive, and we love the ‘traffic light system’ that the machine uses. It has three different light settings for the temperature being ‘too high’, ‘cooling’, and ‘cool’. These lights can be quite reassuring. Like the red light is saying: “Man, it’s hot today! Hold on while I cool this down”. If your number 1 priority is a quiet portable AC – we’ve not found any other which tops this DeLonghi model. While ‘whisper quiet’ isn’t as silent as the name suggests, it’s certainly at the front when it comes to keeping those decibel levels down. Amazon's #1 Best Selling Portable AC. 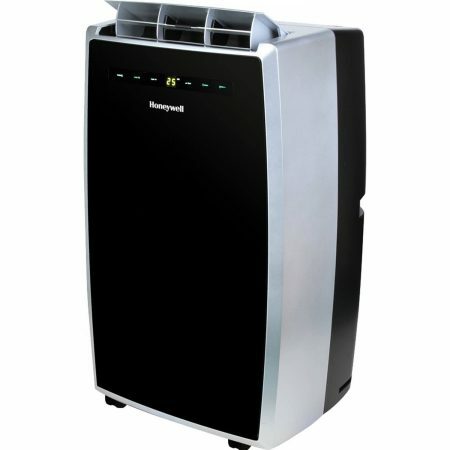 The Honeywell MN12CES is Amazon’s #1 bestselling Portable Air Conditioner. First, it really looks the part. Available in several variations (we love the black and silver), the sleek design and electric controls look great in any modern home. 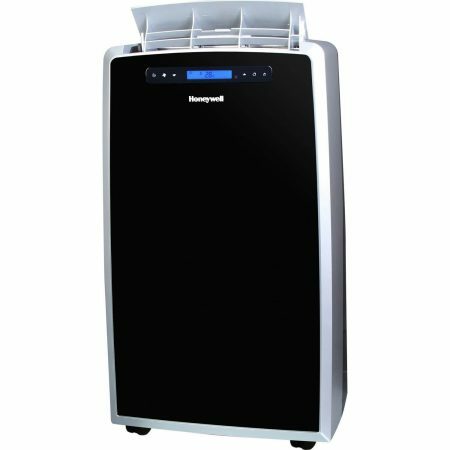 With this MN12CES model, Honeywell has made a portable AC that is efficient, capable, and above all else – quiet. Honeywell are also the only air conditioner manufacturer that lists the maximum noise levels. In this case, the MN12CES has a listed maximum decibel rating of 55 – which lies between quiet and normal conversation (and this is white noise: a lot less distracting than speaking). The controls are superb. The temperature gauge gives you a real measure of the temperature (rather than just showing the target temperature). It also has a variety of easy-to-use modes to meet whatever demand you have. It’s capable of powering through a red hot summer’s day, or quietly keep a room cool at night (without sounding like a jet engine). Honeywell have also proven that they’re founded on solid customer service. In our research, we found multiple reports where customers have been shipped entirely new window kits, if the standard sets don’t fit properly. All in all, this is a great appliance which meets every demand we have for a air conditioner. In addition to being quiet, it also boasts solid build quality – crafted by a reliable manufacturer who have put their money where their mouth is with a certified 5 year warranty. Plus, being the #1 Portable Air Conditioner on Amazon is one huge statement. This Whynter's dual hosed exhaust allows for more efficient cooling. The Whynter ARC-14S is our ‘big beast’ recommendation. It puts out a powerful 14,000 BTU of cooling power. There are a lot of other appliances that appear to have a 14,000 BTU capacity – but this Whynter model just seems to do its job so much better than the rest. This is partly from the solid engineering design and quality parts – but also due to the dual hose system. This system increases the machine’s efficiency thanks to much less heat leaking out of the exhaust. A major drawback of single hose machines. We’ve covered these hose types in more detail – in the ‘Ventilation’ section below. We wanted to include an air conditioner that packed a real punch for those who need the extra cooling power, but without a lot of sound while it’s operating. This Whynter model meets these demands well. With strong capacity backed up by a dual hose exhaust system, it’ll take care of even the hottest and humid days without a drainage bucket needing to be touched. The big brother of the first honeywell - more modern and more powerful. Introducing the big brother to the 12,000 BTU Honeywell model above. This more powerful version is of similar size, with the larger compressor only weighing 6lbs more than the 12,000 BTU model which tops Amazon’s bestseller list. 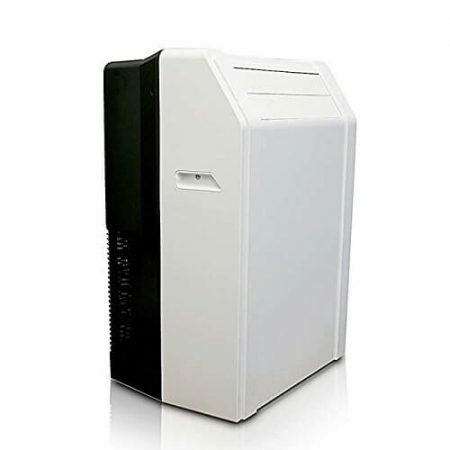 It looks sleek, has great build quality, and is still relatively quiet for the amount of cooling power it can pump out. Honeywell have stayed consistent in their goal to keep noise levels to a minimum. The maximum decibel level for this model actually stays at the same as the 12,000 BTU model; 55 dB. As well as the extra cooling capacity, another upgrade is in the electronics. While the smaller series isn’t lacking in that department (it’s controls were one of the best we’ve reviewed), this big brother has a miniature screen for more control over the appliance. The one downside is, of course, the extra price that comes with the higher power. However, we’d recommend this model to anyone who wants a long-term solution to any air conditioning problem in a large space. No matter the heat or humidity. As before, Honeywell are also a great manufacturer and have been known to ship extra window kits to customers in need – so you’ll be in good hands, too. Great design and looks Large; portable doesn't always mean "a joy to move"! Ideal for anyone who want to ensure that they’ll be able to keep their space cool, no matter the outside temperature. With great looks, quiet operation, and easy to use functionality – there was no question over whether or not this Honeywell would make it into our top list. Small, simple, and easy to run. 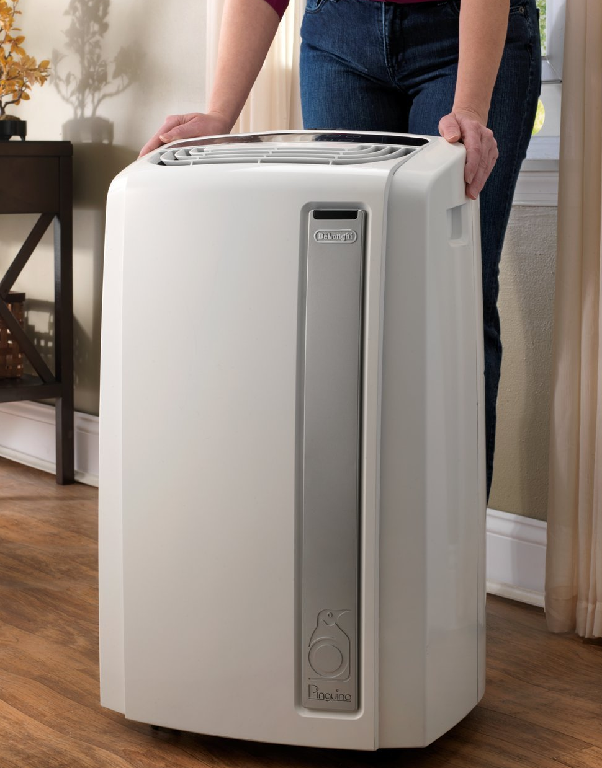 We’ve got Black & Decker’s Portable AC as our top 10,000 BTU choice. For the same reason that the DeLonghi is our top 12,000 BTU machine: Black & Decker have created a ‘sleep mode’ just for this air conditioner. Since 10,000 BTU air conditioners are typically used in bedrooms, Black and Decker have brought in a function with us light sleepers in mind. The sleep mode allows for the room temperature to gradually increase by 2oF over 2 hours once activated. While this is unnoticeable while you’re drifting off to sleep, it makes a huge difference in the amount of effort the air conditioner needs to use. Resulting in a much quieter atmosphere to sleep in. The model is also comparatively small, too. It’s 5 inches slimmer than most standard 17” air conditioners – ideal to be tucked away in the corner of a small bedroom or office. This is a great appliance for those who are in need of a cool bedroom but can’t sleep with much noise going on in the room. It’s small enough to slot into tight corners, and the sleep mode shows that the air conditioner has been designed with light sleepers in mind. To top it all off, it’s one of the cheapest models on the market that while still having the quality we look for in our top list. A great buy. Another great little runner. We love the vent panels opening. This 10,000 BTU Whynter model is another great little runner. While it doesn’t have any ‘special modes’ like the Black and Decker, it runs quietly enough by itself. While it’s not the snazziest of models, it’s got a bit of charm to it, and the air ducts glide open by themselves very smoothly. Very cool. One area where this model really shines is in its low cost, and energy efficiency. It’s been designed specifically for minimal energy consumption. So you can leave it running with no qualms about harming the environment.. or your electric bill. That said, just because it doesn’t use a ton of juice doesn’t mean that it’s not capable of cooling a room – though it is wise to make sure that your space will be within a total of around 400 square foot. Even though it’s a smaller model, the Whynter isn’t lacking on the features front. It’s still capable of self-evaporating to avoid needing drained apart from on the most humid of days, and has well-functioning controls (though they don’t quite look state of the art, they do work well). A great solution if you have a small space and/or just need a little bit extra cooling power in one area of your home. Without sacrificing on quality or noise, this portable AC won’t break the bank or cause your electricity bill to go through the roof. A quality portable air conditioner costs a pretty penny, so you want to make sure you’re going to stay happy with your purchase for years to come. Knowing what features are important to you is how to find the model that feels like it was made for your home. 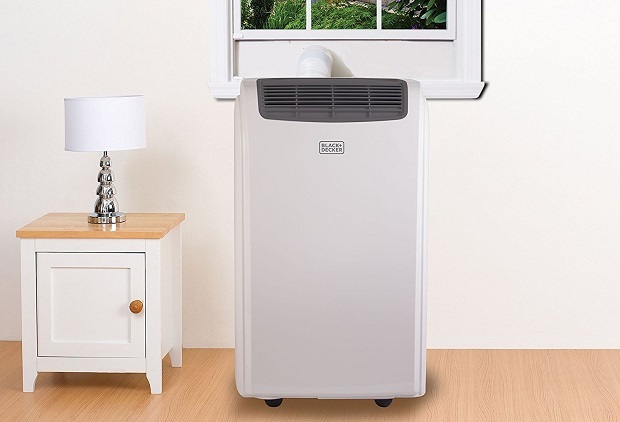 Below are the 4 biggest factors which make up a good portable air conditioner. First up are BTU’s, or British Thermal Units. Where 12,000 BTU is the power you need to freeze 1 ton of water into ice in 24 hours. Pretty cool. The power of an air conditioner is the most important factor. Too much power will cool so fast it won’t remove moisture from the air, leaving you cool but clammy. Not enough power, and that poor AC will be whirring hard all day long. 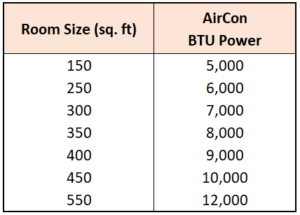 Use the table below to find the BTU capacity you need. If the room is frequently occupied by more than 2 people, add 600 BTU per extra person. If it’s a kitchen, add 4,000 BTU. Finally, if the room is shaded from the sun, lower the capacity by 10%. 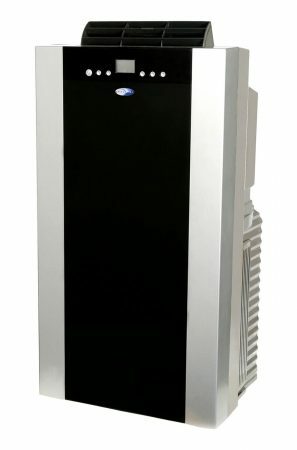 Need an AC with less than 8,000BTU? Check out our quietest window ac guide! 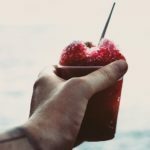 The reason why we wrote this guide – noise! Unfortunately, there’s still no portable air conditioner in the world that is truly silent. But there’s plenty getting there. The best of which we’ve listed below. These noise levels are surprisingly rare for manufacturers to list. In fact, Honeywell are the only suppliers who we’ve found to list the maximum noise produced by the Portable AC. Though, this is because they’re one of the quietest on the market, so it’s a great selling point! The second factor about how noisy an AC gets, is you! It’s how you use the appliance. 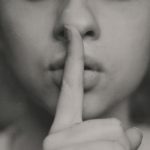 Any portable air conditioner worth paying for will have a selection of features that you can use to keep things quiet. Programmable Timers: Set the machine to do all the hard cooling work before you’ll be in the room. Multiple Speeds: Keep a space cool on a low setting once the room’s been cooled down. Sleep/silent modes: Reduce the noise, often at the cost of some cooling power. Check out our top 10,000 and 12,000 BTU recommendations below for examples. While portable AC’s do blow out cold air, they also need to exhaust the hot air that comes as a result of operating it’s electronic parts – typically through a hose that connects to your window. It also needs air to use to keep it’s interior parts cool enough to operate – so if the only ventilation the machine has is the one hose, it needs to pull in air from the room to keep itself cool. Portable air conditioners that come with a second hose are able to pull air in from outside to keep itself cool, which makes it much more efficient – since it’s not stealing back some of it’s own cool air to function. Though models with two hoses generally use more energy to run, they’re also more efficient with the energy they do use, and can be quieter when operating as a result. 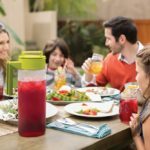 As with programmable features, any modern portable appliance that’s worth having will be able to self-evaporate most of the water that condenses because of the machine operating. While older machines required drainage buckets to be emptied (sometimes frequently, on humid days), the portable AC’s that have made our best list all have self-evaporation power; evaporating the water out through their exhaust hoses. While their drainage buckets may still need emptied on the worst of days, they should be capable enough to just ‘set it and forget it’. 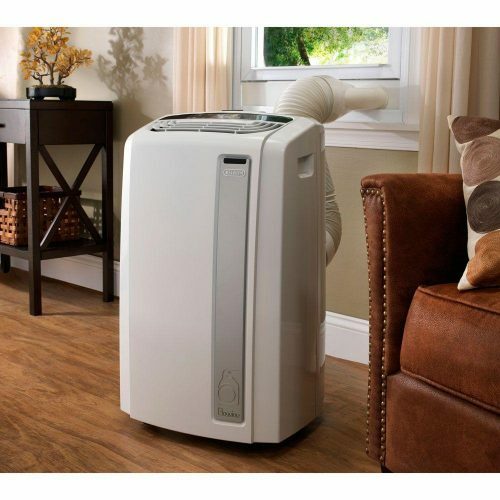 While we’ve compared and contrasted between all the air conditioners above, remember that these are the cream of the crop when it comes to portable air conditioners. What matters most is which one will suit you personally, which we hope our buyer’s guide above helped you to decide. If you’ve not fallen in love with any of our recommendations here, then take a look Amazon’s Bestselling List of Portable Air Conditioners for more inspiration. For an alternative cooling solution, check out our guide to window air conditioners – where we’ve also focused on finding the quietest appliances to include in your home.